Before senators press Transportation Secretary Elaine Chao this week about the all-options-on-the-table approach for funding infrastructure projects, the U.S. Chamber of Commerce has been extremely clear about one thing: If you’re for raising fuel taxes, they have your back. “This is the only tax that the chamber ever supported increasing,” Ed Mortimer, the chamber’s vice president for Transportation and Infrastructure said March 19 at a legislative conference hosted by the American Public Transportation Association. 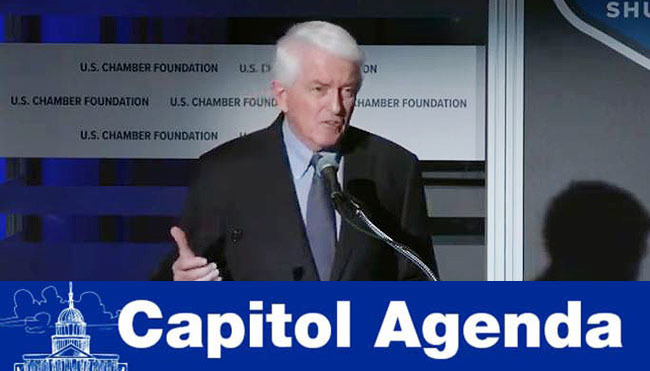 Chamber CEO Tom Donohue’s agenda for the year has included sounding the alarm about the country’s infrastructure. And, he’s been calling on lawmakers to act on the gas and diesel tax. Since January, Donohue has met with reporters, convened high-profile meetings and testified before Congress to say: Endorse raising the Clinton-era fuel tax rate to ensure long-term funding for transportation projects, and the chamber will back you. March 27, 10 a.m.: Secretary Elaine Chao is scheduled to appear at the Senate transportation funding committee to defend President Donald Trump’s fiscal 2020 budget request. March 25, 9:30 a.m.: The International Energy Agency hosts a webinar titled, “Global Energy and CO2 Status Report.” Participants include IEA Executive Director Fatih Birol. March 26, 10 a.m.: The House Oversight and Investigations Subcommittee meets to review the recovery funds for hurricanes Harvey, Irma and Maria. March 27, 3 p.m.: The Aviation and Space Subcommittee meets on airline safety. Witnesses include Robert Sumwalt, chairman of the National Transportation Safety Board, Calvin Scovel, Inspector General at the U.S. Department of Transportation, and Daniel Elwell, acting administrator at the Federal Aviation Administration. March 28, 8 a.m.: Axios hosts an event titled, “Transforming Transportation.” House Highways and Transit Subcommittee leaders Del. Eleanor Holmes Norton (D-D.C.) and Rep. Rodney Davis (R-Ill.) are scheduled to participate. When the president insists an issue is capable of garnering bipartisan backing on Capitol Hill, there’s reason to believe. Still, the transportation community continues to ask: Where’s the bill? Presidential aspirant Sen. Elizabeth Warren (D-Mass.) is not a real spokesperson for a gas tax hike. From the Senate committee that oversees trucking policy, comes a chief of investigations. Commerce Committee Chairman Roger Wicker (R-Miss.) announced recently that former U.S. Marshals officer Robert Turner will lead the panel’s oversight and investigatory portfolio. Sources on Capitol Hill tell Transport Topics advancing an autonomous vehicles legislation is just not a major priority right now. It was just announced there was no collusion with Russia. President Donald Trump on March 24, reacting to Special Counsel Robert Mueller’s report.